Community Servings, based in Jamaica Plain, is a not-for-profit food and nutrition program providing services throughout Massachusetts to individuals and families living with critical and chronic illnesses. Community Servings delivers 395,000 free, home-style meals to about 1,300 people per year, who are too sick to cook for themselves or their families. Come out to a show and support this awesome cause. 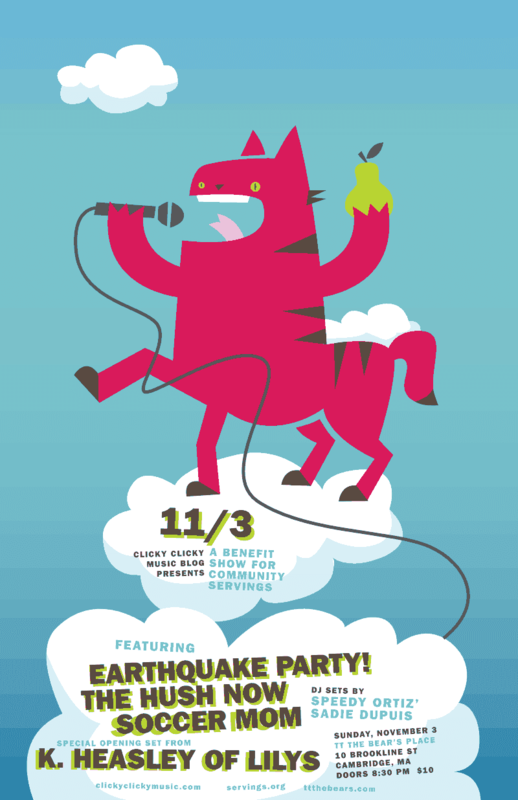 On November 3rd, local Boston music blog, Clicky Clicky Music will present the Second Annual Community Servings Benefit Show at TT the Bear’s in Cambridge to support this amazingly generous non-profit. This year’s lineup includes Kurt Heasley of the long-running, shape-shifting band Lilys, the big anxious guitar sound of Soccer Mom, the pop/rock brilliance of The Hush Now (back from a two-year hiatus and previewing an album they aim to release in early 2014), and a capping headline set from hyperpop spazzes Earthquake Party!. This show is 18+, $10, doors at 8:30p. Raffles and additional charitable donations will be available. Proceeds benefit Community Servings. Tickets can be purchased the day of and in advanced.